José Diego María Rivera, Mexican, 1886 - 1957. Printed by George C. Miller, American, 1894 - 1965. Published by Weyhe Gallery, New York. Emiliano Zapata (1879-1919), a leader of rebel troops that brought about the revolution in Mexico in 1910, was an impassioned advocate for the redistribution of the vast lands owned by rich ranchers to poor Indian peasants. After his assassination in 1919, Zapata rapidly became one of Mexico's most revered political martyrs. Diego Rivera selected heroic themes from the nation's history for many of the grand murals he painted in Mexico in the 1920s. 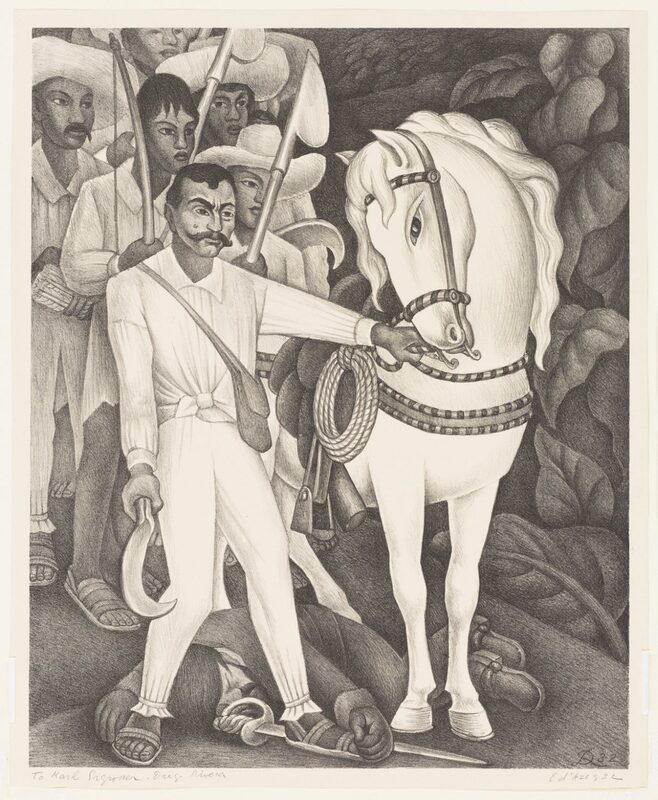 He based his lithograph of Zapata on one of the murals he painted in the Palace of Cortez in Cuernavaca in 1929-30. This example is an artist's proof (inscribed "E d'A" for épreuve d'artiste) that Rivera dedicated to Carl Zigrosser, then director of the Weyhe Gallery in New York, the publisher of Rivera's lithographs.